I had always wanted to read The Haunting of Hill House, but I could never find it in any of the local book shops. When I enquired about it, I was told that the is not possible to buy The Haunting of Hill House in the UK. One shop offered to import a copy from the States, but that sounded like a lot of hassle. I searched for it on Amazon instead and it may have been better if I’d done that in the first place because I found a copy quite easily. So if you also have difficulty in sourcing a copy of this book, my advide is to try looking online. 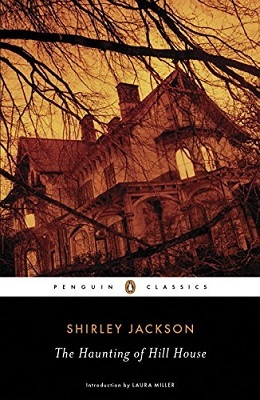 At the beginning of the book, the reader is told Hill House has a reputation for being haunted. When Dr. John Montague first hears about the house he is intrigued. Montague is a doctor of philosophy, but he has an active interest in the supernatural so he decides to rent Hill House, live there for three months, and study it. Montague engages two assistants to help him with his research: Eleanor and Theodora. A third assistant, Luke Sanderson, is forced upon the doctor by the house’s present owner, who is Luke’s aunt and wants to keep him out of trouble for a while. Theo has an outgoing and vibrant personality. She owns a shop, has a talent for sketching, and also seems to enjoy being the centre of attention. However, the thing Montague finds most interesting about Tho is her high level of ESP. It is also hinted, early on in the story, that Theo is a lesbian. She does seem to get quite cosy with Luke though, so I got the impression she probably a lady that swings both ways. Eleanor Vance is a slightly sad character and is a very different kettle of fish from Theo. Eleanor has spent most of her life looking after her ailing mother. When their mother died, Eleanor’s sister, Carrie, insisted their mother’s house be sold and the money be split between them. The sale of the house left Eleanor homeless, so she had to go and live with her sister and brother-in-law and their children. Eleanor and Carrie also bought a car together, but Eleanor is hardly ever allowed to use it; so she feels she has every right to take the car and use it to drive to Hill House. Unfortunately, Carrie refuses to part with “her car”. “It’s half my car,” Eleanor reminds her, and also points out that Carrie and her family are going away for the summer and won’t need the car. Carrie is having none of it. Neither is her husband. Eleanor is not going to take “Carrie’s car” and that is all that there is to it. Eleanor rebels. She sneaks away and takes the car anyway. Good for her! The situation with the car paints a picture of the way Nell’s life has been: walked over and overruled. Eleanor’s life has been sad and lonely, if not wasted, and her opinion seems to have little importance to her remaining family. If anything, Eleanor is the convenience sister. In fact, with no life of her own, Nell seems to rely heavily on a fantasy one to try and fill the hole inside her. When she arrives at Hill House it is probably the first time that she has ever felt accepted or wanted. Hill House also seems to take a special interest in her, which is frightening for Nell and has devastating consequences. The Haunting of Hill House is 246 pages long and was first published in 1959. Although it was written a relatively long time ago, the story doesn’t have a particularly dated feel to it. The characters are lively and believable and it’s easy to sympathise with the lead character, Nell. Some of the other characters are also very likable, but a few of them are suitably obnoxious. Montague’s wife is in this latter category. She whisks into the story in the later pages of the book and proves to be such an overbearing and annoying woman I couldn’t help but wonder about the untold story: what was the Montagues homelife really like? Although The Haunting of Hill House is quite a dark story (that’s one scary old house! ), but the prose has a light and airy feel to it that makes the book an easy and enjoyable read. It’s one of the best haunted house stories I have ever read and the book is not only chilling, it’s a true classic that every fan of dark fiction should try to read at least once.